We were so excited to work with Chef Stephen Durfee's students at the CIA again this summer! Sadly, I was away and not able to attend in person but I sent the Paulas in my stead: two of the awesome QM volunteer crew members, Paula Philipps and Paula Brutocao. 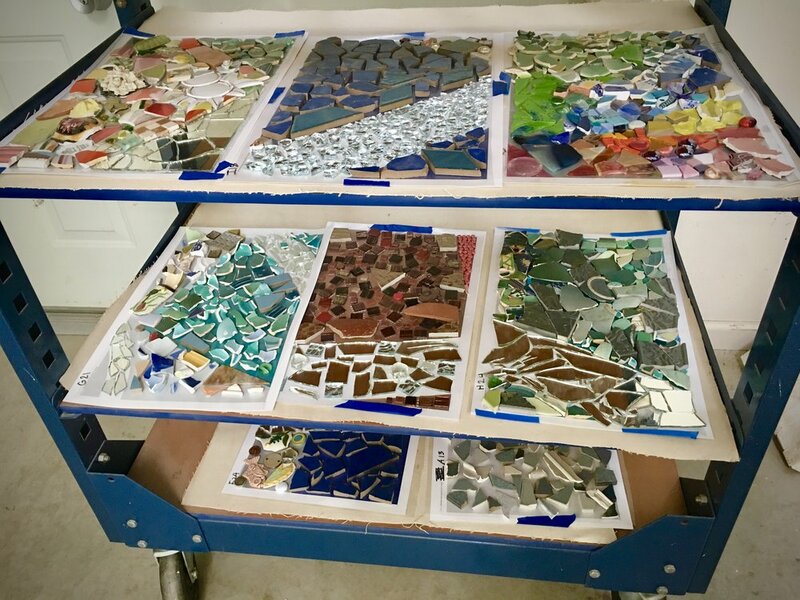 In June, we held our first mosaic workshop with TeensConnect, a Napa non-profit founded by Jeni Olson to "support, engage, and empower teens through programs centered around art and wellness, peer support and volunteer projects." We are holding several public mosaic workshops this year with the support of Nimbus Arts. Nimbus is the perfect partner for the Quake Mosaic in so many ways. Not only do they have a beautiful work space, talented and generous staff members, but they have loads of experience with large collaborative mosaic projects with their incredible Hundreds of Hands program. What an incredible weekend at Napa Makes! So much positive creative energy, Bay Area makers-galore and a TON of new Quake Mosaic folks. We had so many mosaic makers, we ran out of material and had to run to the studio for more! Had a fun time painting the windows at local restaurant, Carpe Diem, this weekend. It was a chilly night, painting a snowy forest of birch trees live for their guests and several friends that stopped by, but the hot toddies helped! The windows will be up through February so stop by and see how many woodland animals you can find hidden in the trees.